AUGUSTA, Maine — U.S. Sen. Susan Collins and longtime University of Maine nutrition professor Katherine Musgrave were honored Saturday as the latest two inductees into the Maine Women’s Hall of Fame. The two inductees join more than 30 other women who have received the honor, which is administered by the Maine Federation of Business and Professional Women. 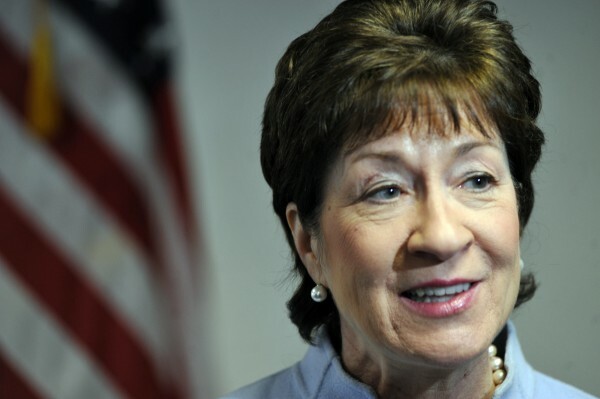 Collins, a Republican first elected to the U.S. Senate in 1996, was recognized for her work on behalf of women, small businesses, health care and the environment. The Republican also was praised for her willingness to work across the aisle on issues. A member of several influential Senate committees, including Appropriations and Armed Services, Collins also is distinguished as the longest-serving senator now in office never to have missed a roll call, with more than 4,500 consecutive roll call votes. During her speech, Collins talked about two members of the Maine Women’s Hall of Fame who inspired her: Pat Collins, her mother, who was inducted in 2005, and the late Sen. Margaret Chase Smith of Maine. But for most of her speech, Collins talked about the need for a more civil tone in the public debate in Washington and nationally. Maine’s junior senator said the blame lies with both parties and with “hard-liners” on both sides who, thanks to 24-7 cable news and talk radio programs that cater to specific point of views, now have a constant platform. But she said the American public also plays a key role. The other honoree, Musgrave, has taught thousands of students and helped shape nutrition policy in Maine and nationally during her 42 years on the faculty at UMaine in Orono. A champion of improving childhood nutrition, Musgrave also has reached Mainers of all ages through a weekly radio talk show and regular newspaper columns and as a consultant. Musgrave was nominated by former first lady Karen Baldacci, who recalled Saturday how, as a college freshman, her roommate raved about her energetic and inspiring food and nutrition professor. Baldacci said she decided to tag along with her roommate to class one day. Although officially retired for more than 25 years, Musgrave continues to teach both in person at UMaine and online. And she consistently receives among the highest marks from students. But regardless of the latest trends, Musgrave said, she believes anyone can stay healthy by following these basic guidelines: Choose meals that are well-balanced nutritionally, eat three meals a day — preferably at a dinner table with family — and exercise regularly. In addition to Margaret Chase Smith and Pat Collins, other members of the Women’s Hall of Fame include U.S. Sen. Olympia Snowe, Olympian Joan Benoit Samuelson, writer and noted suffragist Florence Brooks Whitehouse and U.S. Rep. Chellie Pingree. The ceremony for Collins was interrupted briefly on Saturday — the eighth anniversary of the U.S. invasion of Iraq — by a member of the group Military Families Speak Out, who criticized the senator for her 2003 vote in support of the war and urged her to decline the honor. Collins listened at the podium and then responded that the remarks were an example of democracy in action, which garnered robust applause from the crowd. More than a dozen anti-war protesters then gathered outside of UMaine Augusta’s Jewett Hall, holding signs calling for an end to the military operations.